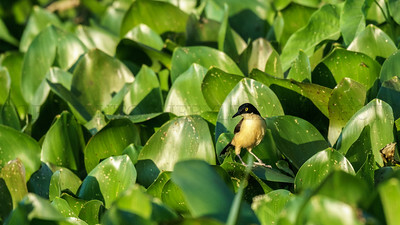 a view from the river, Black Capped Donacobius in Water Hyacinth. My visit to Brazil was timed to coordinate with winter. Winter in Brazil means no rain and the rivers get quite low bringing many animals to a small area. It also means that the Pantanal is easily accessible. The Pantanal is a natural region encompassing the world's largest wetland. During the rainy season 80% of the area is covered by water. 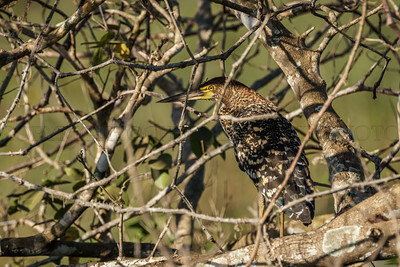 Beautifully camouflaged Juvenile Rufescent Tiger Heron. this heron is quite common in Brazil and is not considered endangered. These huge, prehistoric looking storks build very lage nests that grow year by year. 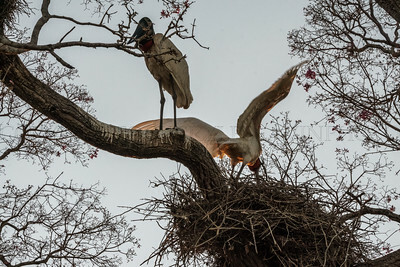 It is sunset and one of the pair is on guard as the other brings materials to the nest., You can see the flaming sun reflected on the storks wings and stomach. The striations of this juvenile help her survive by camouflage. 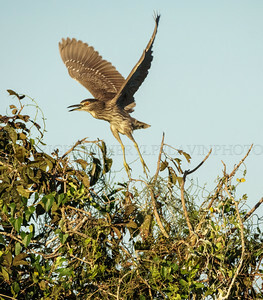 The Black Crowned Night heron is the world's most plentiful heron. They usually fly at night, although this captured in the early morning. The kitchen threw out day old bread crumbs for the birds. They ate every last one. 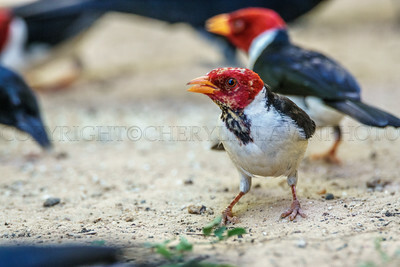 These charming small cardinals ate in a large group and were joined by chopis (blackbirds). They vanished when the crumbs were gone and descended when the crumbs reappeared. 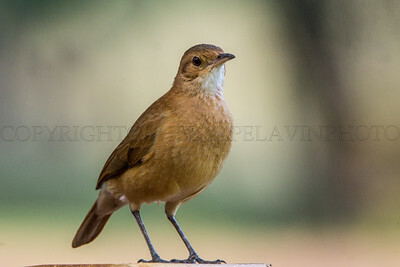 This bird builds a an extraordinary nest, domed and made of mud and straw. The bird pairs do not re-use the nest and it becomes available for other creatures. 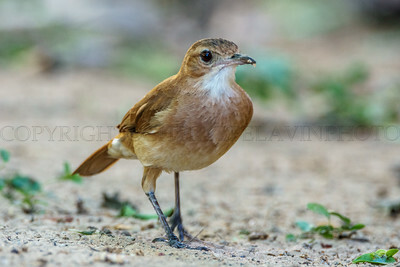 It is a large ovenbird and lives in second growth scrub and pastureland eating insects it finds on the ground. 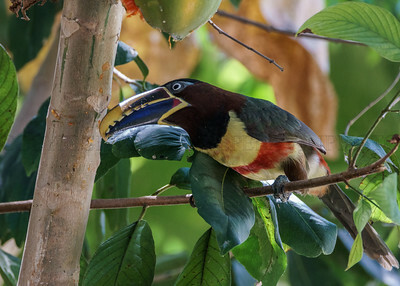 This amazing looker was on the branch because the kitchen gave him the papaya over his head. He made a big hole in it. 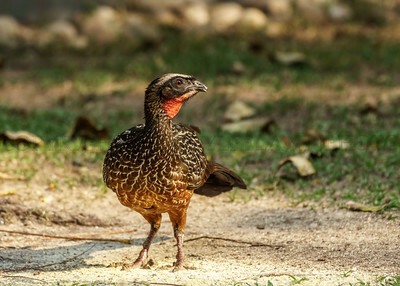 This is a "backyard bird" for the folks of the Pantanal. He just stayed right where he was and worked on that papaya. Parrots are social creatures and these two birds did everything as an interaction. 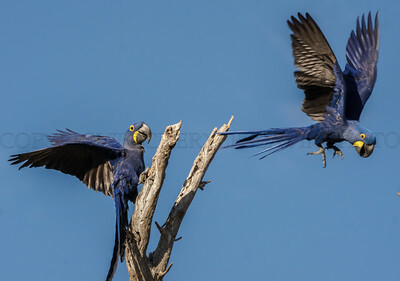 the Hyacinth Macaws are the largest of the parrots. Their faces and antics make them irresistible. 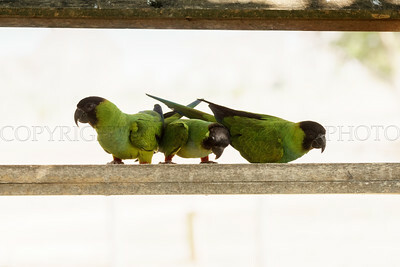 What is not to love about these parrots? 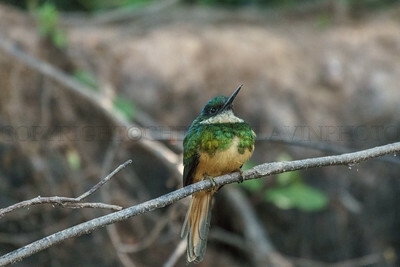 This jewel of a bird sits on an exposed branch close to the river and sallies forth to catch flying insects. Once caught he hits the insect a few times on a branch, to stun it. Then he removes the wings and eats it. Very neat! 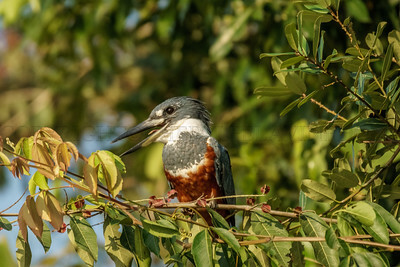 The Amazon Kingfisher is a large kingfisher and perches to hunt in conspicuous spots. He will pursue fish and crustaceans by diving down to catch them. He then stuns the catch and swallows it whole, head first. He seems to be laughing too. 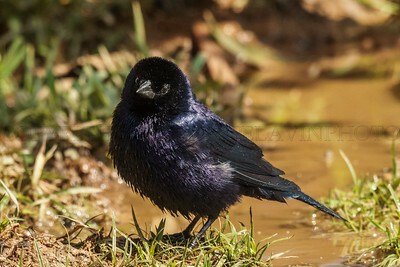 Another "backyard bird" for the Pantanal. These fellows were on a bird table. There were a lot of them. The Pantanal has numerous parakeets and for some of us these were just too common, but for me these birds were too cute not to love. 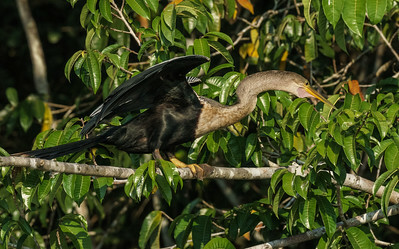 During the months of winter in the Pantanal water is scarce. This Chopi made good use of a mud puddle on the grounds of the posada. 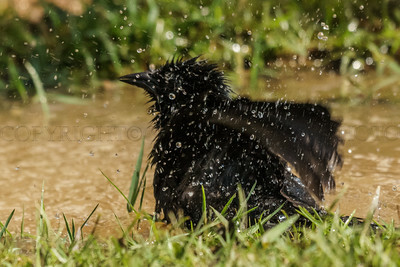 He and his mates splashed around and bathed. 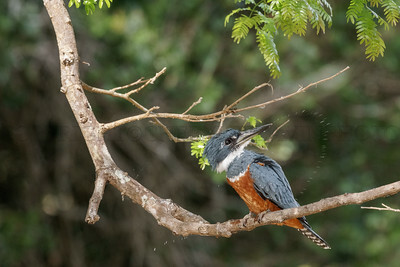 I understand that the Chopi has movement blur,, but it was the wild gyrating of feathers and spraying water drops that grabbed me. This bird will REALLY wake you up in the morning. It's cries are staggering. You can Google a recording of a pair singing...for me it brought me right back to the pousada! 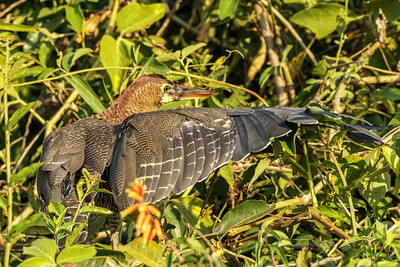 The Anhinga is the only darter in the New World. It likes wetlands and catches fish by spearing them with it's long, sharp beak. He resembles something prehistoric, look at his big, yellow webbed feet. The Rufescent Tiger Heron frequents wetlands from Central America through South America. It is solitary and finds it's food by the water including fish, beetles, crustaceans and dragonfly larvae. 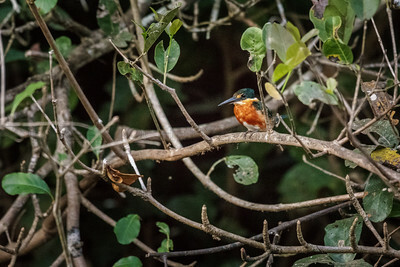 A tiny kingfisher, this adorable little bird is so small and quiet it is often missed. The Pygmy nests in a burrow along the bank of the river, like it's bigger cousins. 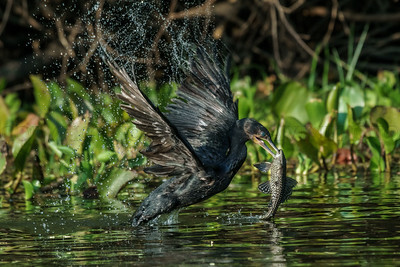 A bird with big numbers in the neotropics, this cormorant just caught the fish thrown by the boatman. Our leader would get his camera lined up and then more or less yell "go" and the boatman threw the fish. I am amazed I caught this beautiful picture, as I normally freeze when an animal is in action. 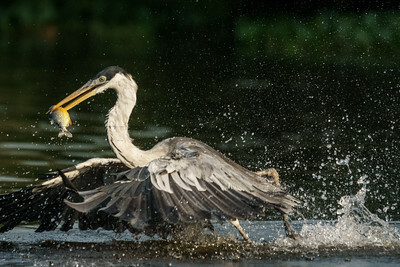 I don't usually think of herons as predators. I know they are, but normally they have to stand still for a long time to catch their prey. In this instance the fish was flung across the river and the birds knew exactly what was up and were there for the treats. The Kitchen staff put a mound of white rice on an outdoor table and the birds came in and ate every grain. My co-travellers were off in the heat looking for exotic birds. We were at this particular pousada because it was near a Harpy Eagle nest. This was one of the reasons I went on this trip. Sadly the eagles lost their young and had left the nest. They will mate again, in three years and come back to the same nest. 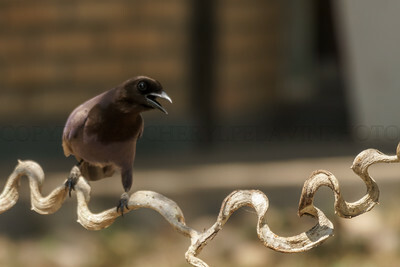 I felt my skills at small bird photography were very limited and the heat really overwhelmed me. I took the afternoon to stay at the lodge and see what I could see. 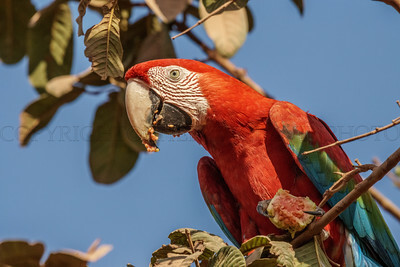 These gorgeous parrots use their claws to hold fruit and bring it to their beaks. I could have watched it forever. We were driving to our final destinations and someone spotted the macaws in a tree. I was thrilled to see them so close-up. My group mates were essentially bird photographers. I went on the trip to photograph Jaguars, Giant River Otters, Toco Toucans and Harpy Eagles. Things don't always turn out as planned. By the time we got to REGUA in the Atlantic Rainforest I was ready to sit down with my camera. The lodge had hummingbird feeders and the birds came. 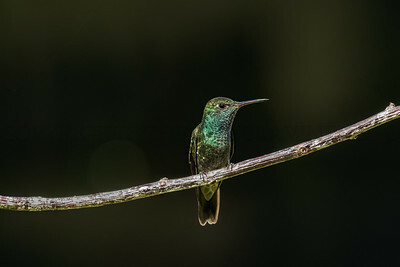 I had no experience with hummers, some of my images were taken with flash, most without. The birds come to the feeder but we had flowers and branches nearby for the birds to alight on, so that the image was more pleasing. Those big red plastic "flower" feeders are attractive only to the hummingbirds. Many creatures are nearly impossible to capture in nature and the set up process is necessary, it is how we share knowledge via imagery. Big animals like the Jaguar or the big 5 in Africa can be seen and photographed, but even they are prohibitive because of the cost of getting to them.